What in the world did Gunther do to save the day? When Gunther the baby elephant finds out that he can float along underwater he is delighted. 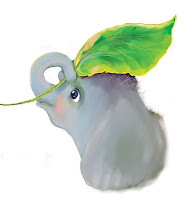 With his trunk held up like a snorkel he floats along happily. Perhaps he should have paid attention because trouble finds him too quickly. 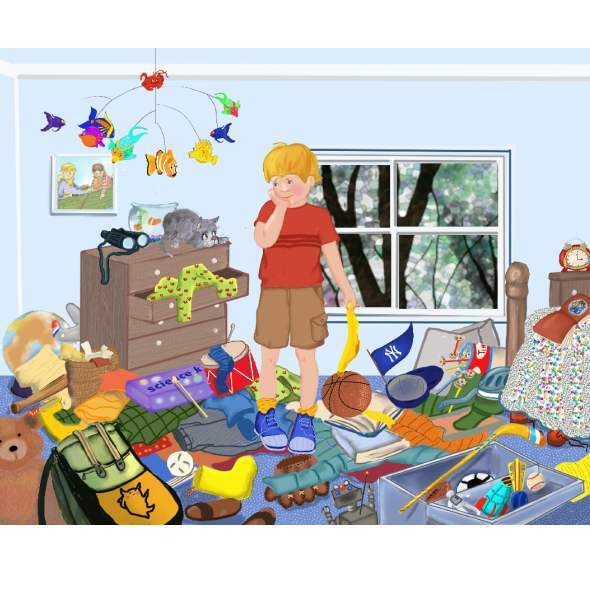 How he solves his problem and saves the day will have you laughing. Gunther has a big surprise in store for anyone who tries to mess up his day. 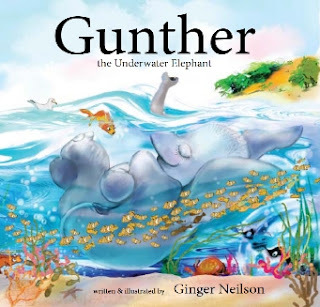 Gunther the Underwater Elephant will be released in mid September. More details will be coming soon. This is a story that I began writing when my children were all at home. I was working full time and had only the kitchen table to draw and paint on, only the kitchen walls to hang the finishes on, and only a few willing publishers in NYC to visit in person. At that time there were "OPEN WEDNESDAYS" at several houses. Anyone could wander in with a portfolio and be seen by an editor. One particularly generous editor looked at the paintings, which were pen, ink and watercolor and asked me: "Do you know how to do a Color Separation?" I tried for weeks after that to master color separations on tracing paper and acetate, but failed miserably at the technique. Gunther's paintings and story were shoved into a folder and it was another year or two before I began working on his story. Then the children grew, games and plays, and college trips took precedence and Gunther sat and waited. Eventually we moved north from the NYC metro area to NH. By this time I had actually illustrated several small books and stories for other authors. 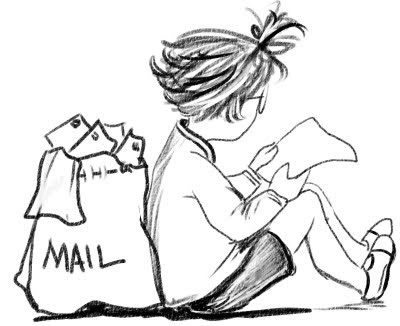 This fall, after many revisions and many words removed, changed, and even some new ones added, Gunther's story is now complete, with my illustrations, and will be released by that "wonderful little publishing company that could"... 4RV Publishing LLC in Edmond Oklahoma. How long was that journey? What is my point in telling you all this? It took more than 20 years from that first drawing and story to get to this point. There are so many artists and authors who are disappointed with those early rejections. All I have to say is you MUST keep trying if you believe in your work. Now this is swell and sweller. My first book as author/illustrator is due out in mid September. And it definitely includes a SWELL..... a swell of waves from page to page to page. Gunther the Underwater Elephant is coming to an ocean near you very soon. 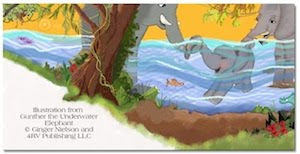 Published by 4RV Publishing LLC in Edmond, OK the adventure follows a baby elephant from his jungle home into an ocean of trouble. 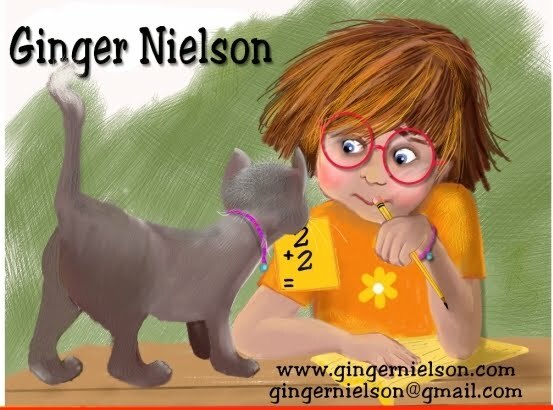 I will be able to share more in a few weeks and hope you will find a space for little Gunther on your bookshelf. You can see more about this book and my work here. Well, really, nobody's perfect. But I am sure Nelson will find a way to create a more perfect order in this chaos.